My relationship with Xamarin started as primarily technical: they worked with our development and engineering teams at Seamgen to answer questions and provide relevant documentation and some onsite support at our San Diego office. It didn’t take long for their business development and strategic partnerships team to take note of what my team and I were doing. They loved the design and strategy we were implementing and tapped us to be a premier client partner. On the design and strategy side this meant we were involved in several of Xamarin's new business pitches and internal platform improvements. A large part of gaining Xamarin’s trust and confidence in a little agency out of San Diego was demonstrating how we work to approach a Xamarin (or any native mobile app) project. My design team and I work primarily in Sketch. We set up all of projects with a library of shared symbols and assets, so when something changes it’s not a huge burden to go back and update every single comp. This is extremely important for white-labeled applications that need to work with multiple different brand assets, fonts and colors and the basis of our thinking in how to approach a new themed UI component library for Xamarin. Much like the way Bootstrap revolutionized the website building experience, Xamarin.Themes introduces unique and functional UI components and styles available exclusively to Xamarin developers. By expanding a developer’s tool kit outside of purely native controls Xamarin.Themes allows developers to create beautiful, functional apps with minimal dependency on designers. Designers can use our themes as a base for creating their own unique app design. Individual themes are available to download in either Sketch or Photoshop files so customization can happen at any level. 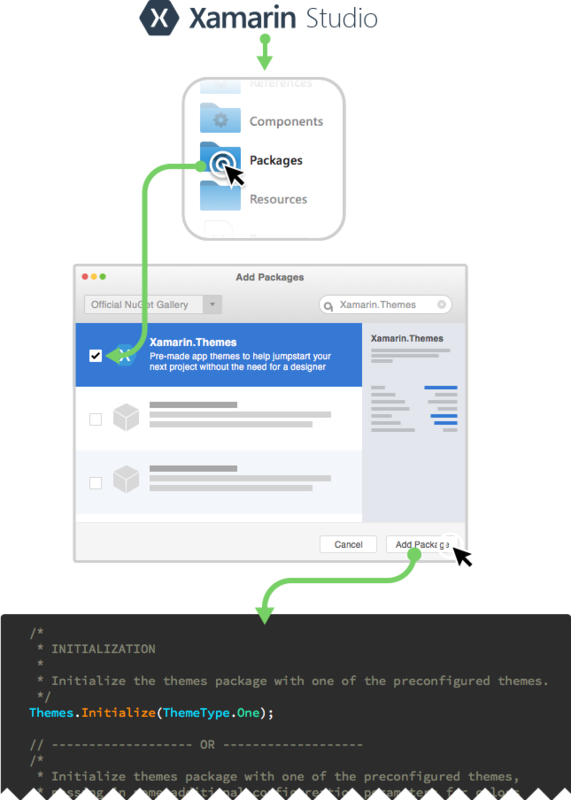 The concept was simple: create a library of pre-built and pre-designed application components that could be installed together as a packaged “theme”. The developer could then customize the theme based on their desired configuration and color scheme and selected typefaces. Over time, the library of .Themes would grow to support multiple design configurations and options, uploaded and curated by the Xamarin community. Our strategy and approach pivoted once the project was taken over by internal teams and ultimately turned in to a new Xamarin product called Pre-Built Apps.